Bulls Eye is an online video slot machine game released in November 1999 and it is offered exclusively at online casinos powered by Microgaming. This online video slot game has 3 reels and 1 pay line. The theme of Bulls Eye is inspired by the game of darts, a highly-exciting professional competitive sport. A brief overview of the theme used in this slot game: The game of darts is basically a throwing sport wherein you throw three dart pins at a time on a dart board for points. Depending on the rules of the game, the aim is to either score higher than your opponent, or the first one to reach 0 starting from 501. Although the game of darts looks very simple, it requires pinpoint precision from the player. The popularity of the sport has bloomed from a traditional pub game into a more competitive sport wherein players try to win in as few dart pins as possible. Microgaming online slot games are available to players in 2 formats – download and no-download. Whether you like to download their software first or you prefer to play instantly without the need to download, then Microgaming surely has online slot machine games to accommodate your every slot gaming preference. Good thing that Bulls Eye is available for instant play, so you do not have to download anything to find out if this game interests you in a way that you would like to spend some real money on it. Bulls Eye is created for players and/or fans of the game of darts. The Bulls Eye online video slot game features a Wild multiplier symbol, a Bulls Eye Bonus Feature game where you can win up to 1,000 coins, a maximum coin jackpot of 5,000, and a maximum cash jackpot of $15,000! The quality of the graphics and sound that Microgaming provides is absolutely fantastic and top notch. They have an impeccable reputation of making the most stunning graphics and true-to-life sound effects that will truly transport you to “that specific theme” they used in any of their slot games. Most people love to play games incorporated with Microgaming software because they have smooth animation and engaging yet non-interfering sounds. Since it is essentially a no-frills type of slot game, Bulls Eye has been designed to have a simple classic slot game with matching sound effects. The casing of the reels includes the reels, buttons and the paytable. The overall graphic design of Bulls Eye displays colors such as green, red, yellow, blue, orange, purple, brown, black and white. The constant background sound effects you will hear in this game resemble other slot machine games that you will find in land-based casinos. Whenever you spin the reels and get winning combinations, simple sounds common in classic arcade games will be heard. 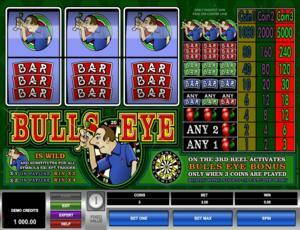 There are no card deck symbols available in the Bulls Eye online video slot game. The regular symbols that you will find in Bulls Eye are the 3-Bar, 3-Bar, 1-Bar, and Cherries. The Wild Symbol is the Dart Man. It is a wild multiplier symbol. Thus, the Dart Man wild symbol not only acts as a substitute for all other symbols (except for the Scatter symbol) in order to you help you form winning combinations, but it also can multiply the payout! The Dart Man wild symbol either doubles (if you get 1 symbol) or quadruples (if you get 2 symbols) the payout of any winning combination it completes, as long as it acts as a substitute symbol. You are paid varying prize amounts (refer to the Payout table) when you manage to form a winning combination with multiple Dart Man wild symbols on an enabled pay line. Take note that the Dart Man wild symbol winning combination payouts are not doubled or quadrupled. If 1 Dart Man wild symbol comes out on an active pay line and it does not complete a winning combination, you are paid out the value of 1 Cherry symbol, multiplied by 2x. If 2 Dart Man wild symbols come out on an active pay line and they do not complete a winning combination, you are paid out the value of 2 Cherry symbols, multiplied by 4x. The Scatter Symbol is the Spin Dart Board. The Spin Dart Board scatter symbol only comes out on the 3rd reel. If you wager a max bet of 3 coins in this slot game and you managed to get the Spin Dart Board scatter symbol to appear on the pay line, you will activate the Bulls Eye Bonus Feature game. Please take note that the Spin Dart Board scatter symbol will not give out any winnings; however, it lets you enter and play the Bulls Eye Bonus Feature game. Bulls Eye Bonus Feature Game – When you manage to get the Spin Dart Board scatter symbol to come out on the 3rd reel, you will trigger the Bulls Eye Bonus Feature game. Take note that you can only activate this bonus game if you wager the max bet of 3 coins. The Bulls Eye Bonus Feature game is basically a Dart Board composed of 20 segments. Each segment holds a credit value wherein you can win credits. You can win up to 1,000 credits in the Bulls Eye Bonus Feature game! Once the Bulls Eye Bonus Feature game is over, you will be then taken back to the main Bulls Eye online slot game, and your winnings from the bonus game will be included to your overall balance. Bulls Eye has 3 reels where you may bet on 1 pay line only. The bet amount is fixed at 1.00. You can wager from 1 up to 3 coins per pay line. Thus, the minimum amount you can bet is 1.00 and the maximum amount you can bet is 3.00 per spin. Please take note that the amounts mentioned above are in Pounds, but they will remain the same if you choose to play in US dollars, Euros, or Canadian dollars. Also, for every coin that you wager, you will activate a higher pay line. You must wager a maximum of 3 coins for the Bulls Eye Bonus Feature game to be enabled. The maximum payout in the regular Bulls Eye online slot game is 5,000 coins. Online video slots are much easier and more fun to play when it has an Autoplay function. In Microgaming online slot games, they have 2 game modes – Regular mode and Expert mode. If you would like to play the Bulls Eye online video slot game automatically, all you need to do is access the Autoplay function by clicking on the “Expert” button located at the left corner of the game screen. In it, you will find the Autoplay setting that lets you play a desired number of consecutive spins automatically.